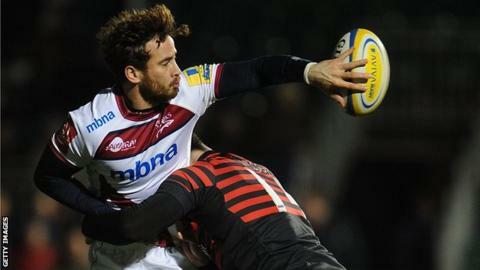 Sale fly-half Danny Cipriani has been named Premiership player of the month. The 26-year-old, who has been criticised for his attitude over the years, has played a leading role as the Sharks have climbed to fifth place. He won the last of his seven England caps in 2008 but ex-England international Austin Healey believes Cipriani deserves a recall. "He has transformed his game from a reckless talent to an influential and controlling number 10," said Healey. The television pundit added that Cipriani "now warrants serious consideration for further honours". "The fortunes and abilities of Danny and Sale seem to have run in tandem over the past 18 months and the comparisons are no coincidence," continued Healey. "A maverick playing within a structured game plan is very dangerous." Cipriani guided Sale to three wins last month, which has moved them to the brink of the Premiership play-offs. He made his debut for London Wasps aged 17 in 2004 and was voted the league's young player of the year in 2008, but his career has been dogged by controversy. On the eve of his England debut he was dropped him from the squad for "inappropriate behaviour" after going to a nightclub in the build-up to the match. Since joining Sale in 2012, Danny Cipriani has played 49 games, scoring nine tries, 48 conversions, two drop goals, 95 penalties and 372 points in total. He finally made his debut against Ireland in March 2008 and scored a total of 49 points in seven matches before falling out of favour under Martin Johnson and moving to newly formed Super 15 side Melbourne Rebels in 2010, where he faced further disciplinary problems. After moving to Sale in 2012 Cipriani scored almost 200 points in his first season but was criticised by owner Brian Kennedy over his attitude and was hit by a bus on a team night out at the end of the season. But this season has been smoother and with Cipriani pulling the strings Sale are just four points being fourth-placed Bath and face fellow play-off contenders Harlequins on Friday.